Coral Springs, FL-based Business Financial Services has joined the ranks of consolidated powerhouses with the announcement of their rebrand to BFS Capital. As part of the move, the company has unified its North American business affiliates. 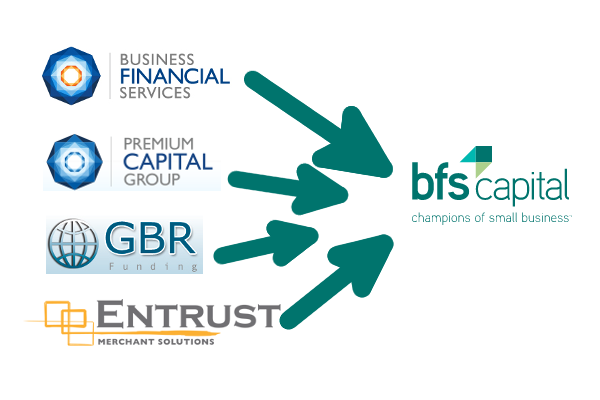 Entrust Merchant Solutions, GBR Funding and Premium Capital Group will now also use the BFS Capital name. Entrust, who was acquired by BFS Capital on August 26th, has become the firm’s direct sales division. Ilya Fridman, Entrust’s former CEO, is now a Senior Vice President of BFS Capital and will oversee sales. Boost Capital, their UK arm, is not changing its name. BFS Capital is the latest small business funding provider to consolidate their affiliates and change their name. Already this year, Merchant and Cash and Capital became Bizfi, AmeriMerchant became Capify, and RetailCapital became Credibly. Industry insiders have noticed one thing in common about all these changes, that they’re memorable. Business financial services could be confused as a genre or a category, a few insiders commented, instead of a company name. Business Financial Services has long been referred to as BFS by industry insiders so unlike other funders that completely transformed during their rebrand, BFS Capital may retain more of their previous name’s goodwill. “Bringing all your companies under one umbrella can bring each company’s unique strengths together in one collective effort, rowing towards one common destination,” said Benton. BFS Capital has been a hot news item this summer. In July, they surpassed $1 billion in lifetime funding.